The weekend saw freezing temperatures and even some snow around the countryside here. While the road squad was swearing profusely and deciding whether to go out on the road or onto the turbos, the Mountain Bike riders were loving the conditions. Several headed down to Frimley Green for the Â Brass Monkey Winter series. Tamara Davenne wrote up her race for us. 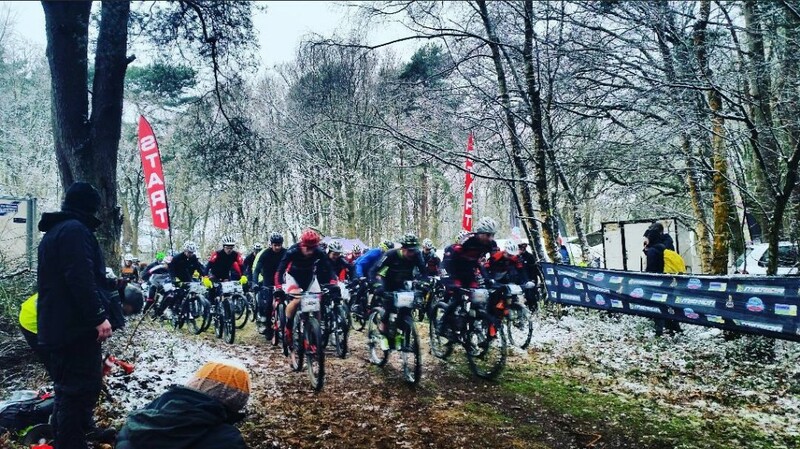 Last Sunday the postponed 3rd round of the Brass Monkey Winter series took place in Frimley Green. Will our MTB captain and Tom were there to represent OUCC on the menâ€™s side. It was a cold day and it was snowing on the way there â€“ we arrived 30 minutes before the start, time to register, to put the bikes together, to get ready and it was time to start the race, COLD! The 2h category started in 3 waves, with the 2h male in the first and the female in the third one. The course was fairly dry despite some rare muddy sections and the forest started to be covered in snow. There were some good hills, some more technical sections and great twists: everything we need for a great race! After a few minutes the pace was set, the start in waves preventing blockages on a course that was mostly single track. I struggled to find sections suitable enough to have time to drink and eat, I had to stop for a gel! In the second lap I started to have mechanical troubles, my chain kept being stuck in the front mech, I had to pedal backward and forward again to unblock it, most of the time it happened in hard uphill sections, the manoeuvre leading to unclipping and running up the hill! It happened at least 7 times in the second lap, I got really annoyed and upset. Since I forgot my Garmin I had to ask someone how far we were in just after the second lap, when he told me 1h30 it was a relief to know that the third lap will be my last one â€“ it gave me more energy and I started pushing again. The mechanical problem was less frequent, there was less and less people around me, few to overtake but no other girls ahead â€“ at that stage I thought I was 4th but I had no idea how close I was to 3rd, I never saw her again during the rest of the race. I gave it all in the last sections, I was tired and I couldnâ€™t have given any more. Will had to stop after his second lap, he was running out of energy and stopped at the car to refuel. This is an example of what you DO NOT want to do in a race. Energy fuel is key, especially in a long event like this, think of what you eat the day before, in the morning and during the race! Despite his near bonk experience he managed some very strong times and did an impressive 4 laps. Tom unfortunately had a bad fall and broke a few spokes – he had to retire after the second lap. It was a fantastic event run by Gorrick! No disappointment as usual, a fantastic job on the track, very friendly staff and very brave marshals in that cold. It was a great day and the snow left some great images in my head â€“ the best being the section in the Christmas tree field covered in snow â€“ magic! We have now 3 weeks to go before our Varsity match, it will be the first round of the Gorrick Spring Series.